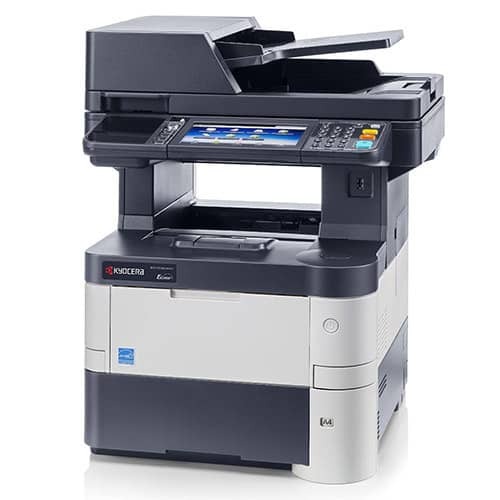 Kyocera M3560idn / M3550idn / M3540idn B&W Multifunction - Perfecta Business Services, Inc.
Environmentally friendly and highly economical, ECOSYS MFPs leverage KYOCERA’s advanced technology to deliver all the powerful functions users demand packed within a compact device, enabling you to work faster and smarter. Incorporating a durable imaging system based on KYOCERA’s long-life patented drums, these MFPs are capable of printing thousands of pages before requiring parts replacement. Because the drum is separate from the toner, only the toner needs to be replaced when depleted. Not only does this reduce waste, it provides your business with an economical advantage. Four walls no longer define today’s office space. You go where your business takes you, and whether visiting a client, working in a satellite office, or on the road, easy access to documents and other information is as essential as ever. The ECOSYS M3560idn Series enables your information to ‘travel’ wherever you do. with a tablet-like home screen that can be customized, similar to a tablet. The ability to save job programs directly to the home screen makes the device extremely user friendly and helps speed project completion.